National Doughnut Day was started in 1938 in Chicago to honor of The Salvation Army "Doughnut Girls"
Wondering where you can grab a free doughnut in honor of National Doughnut Day on Friday June 2? Some of your favorite shops are offering deals. Dunkin’ Donuts: Guests get a free classic doughnut of their choice with the purchase of any beverage. The offer is good all day at participating Dunkin’ Donuts restaurants nationwide. Krispy Kreme: Get any doughnut of your desire-– for free. No purchase necessary. Cumberland Farms: Between 5 a.m. and 10 a.m., customers can receive a free doughnut with the purchase of any hot or iced coffee, HYPERFREEZE or fountain soda at all locations. 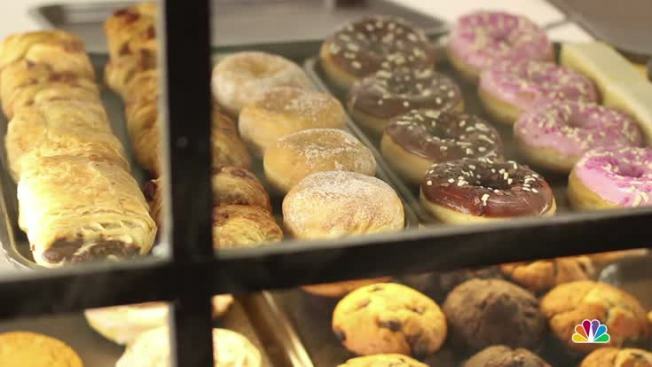 Kanes Donuts: Kanes is offering customers a "Super Dozen." If you purchase a dozen doughnuts you will receive an additional three free. Honey Dew: Customers who visit Honey Dew will receive a free Coco Loco Donut with the purchase of any medium or larger size beverage. National Doughnut Day was started in 1938 in Chicago to honor of The Salvation Army "Doughnut Girls." This unofficial holiday is celebrated the first Friday in June, according to the Salvation Army. To celebrate the doughnut day, the Salvation Army is offering up recipes to for their classic and modern donuts. This year National Doughnut Day marks the 100th anniversary of World War I, where the Salvation Army Donut Lassie was born. The "Donut Lassies," also known as the Doughnut Girls, served along the front lines during WWI and WWII, giving soldiers free coffee and doughnuts in the trenches.